Thank you to everyone who took time to participate in our annual survey. Each year, client feedback is collected through the annual client satisfaction survey. The survey is anonymous and completely voluntary. This year 108 clients, approximately 1/2 of our total client population completed the survey. Your opinion, whether positive or critical, is extremely important to us. Client feedback is used to help us improve, change or add services to Marin Treatment Center. 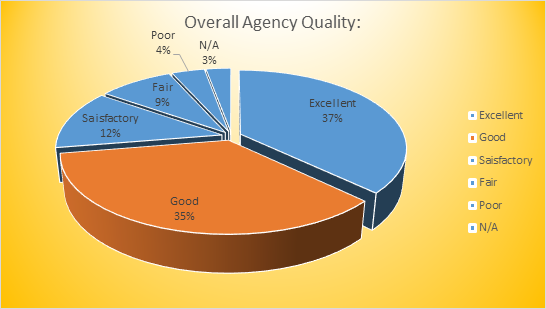 Seventy-two percent (72%) of our clients rated the overall quality of the agency as excellent or good, while 17% rated the agency as satisfactory or fair. 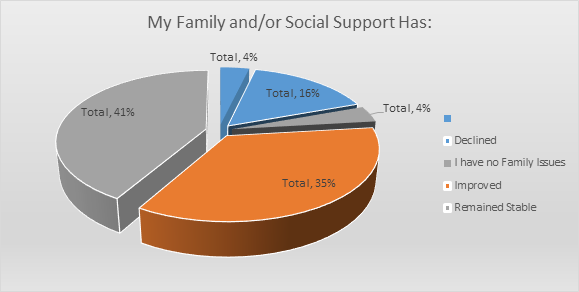 We asked our clients if participating in the outpatient drug free services has helped with their Employment, School or Volunteer status. 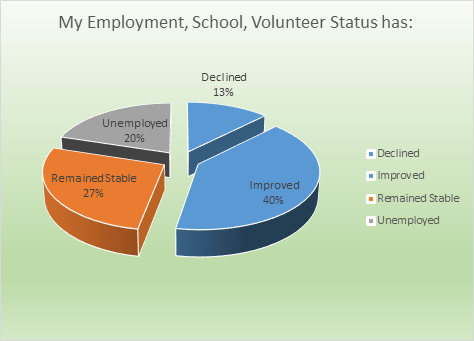 40% stated that their status had improved, and 27% said their status remained stable. Clients in stable living environments tend to be able to create more stability and certainty in their personal lives and recovery. 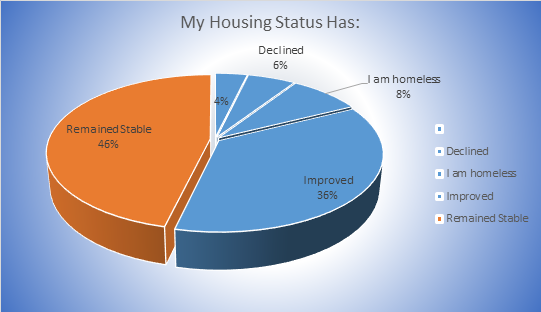 Eighty-two percent (82%) of respondents indicated their housing status is stable or has improved. 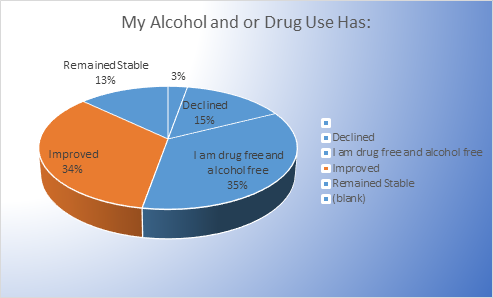 Sixty-nine percent (69%) of respondents stated they are abstinent, their substance use has remained stable or decreased. 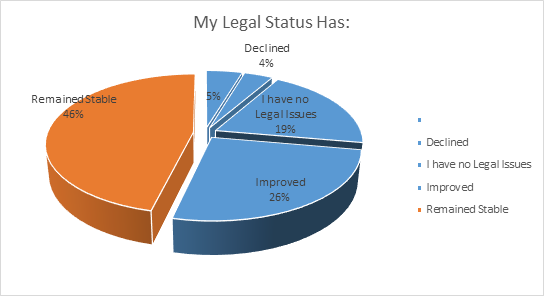 We asked Marin Treatment Center patients about their legal issues: 46% said their legal issues had remained stable, 19% indicated that they did not have any legal issues, 26% of our clients said their legal issues had improved. 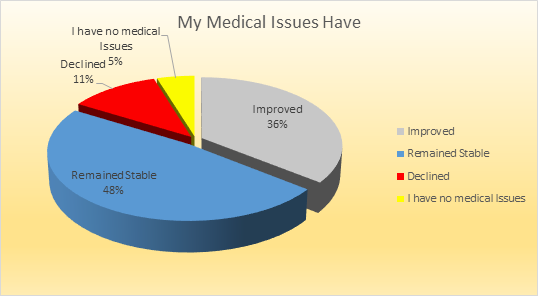 We asked our clients about their medical issues while in treatment: Eight-four percent (84%) stated that their medical issues remained stable, or their medical issues improved, while 5% indicated that they did not have any medical issues. 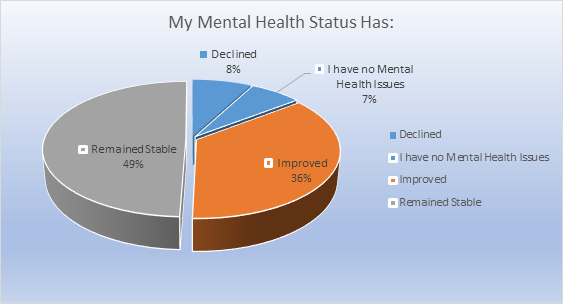 We asked our clients about their mental health status, Eighty-five (85%) indicated that their mental health status was stable, or improved, and 7% indicated that they did not have any mental health issues while in treatment. We asked if the counseling at Marin Treatment Center were beneficial. 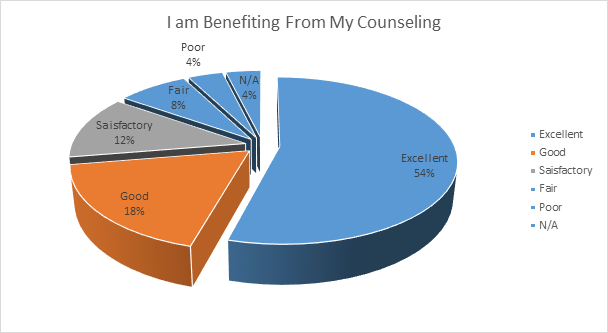 54% of the clients stated that counseling was excellent, 18% good and 12% satisfactory. 8% stated their counseling was fair.